A svelte, versatile camera, the black FUJIFILM X-E3 is a progression in their rangefinder-styled mirrorless series, and features an updated sensor and processor along with familiar classic design. Revolving around the 24.3MP APS-C X-Trans CMOS III sensor and X-Processor Pro image processor, high-resolution stills can be recorded with notable sharpness and clarity due to the sensor's organic layout and omission of an optical low-pass filter. The sensor and processor combination also avails quick continuous shooting up to 14 fps, an extended sensitivity range to ISO 51200, and the ability to record UHD 4K/30 video or Full HD 1080p/60 video. Additionally, when working with moving subjects, continuous autofocus performance has been optimized for improved moving subject tracking and overall accuracy. 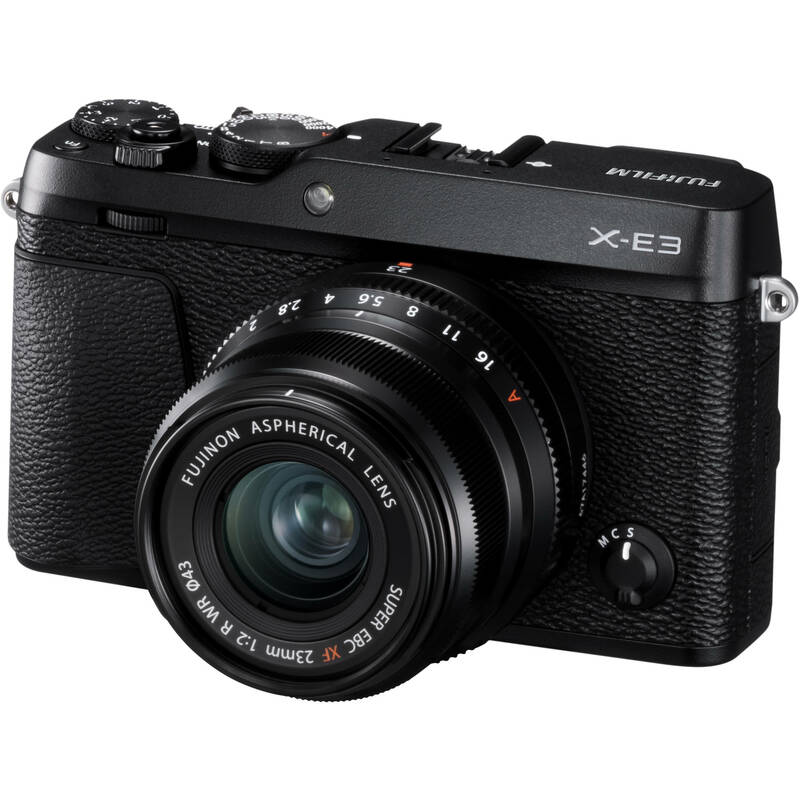 Benefitting the imaging capabilities, the X-E3 retains its retro-inspired physical design complete with a high-resolution 2.36m-dot electronic viewfinder, 3.0" 1.04m-dot rear touchscreen LCD, and physical shutter speed and exposure compensation dials. Also, its wireless capabilities have been expanded to include Bluetooth connectivity for low-power image transferring and remote camera control from a linked mobile device. Included with the X-E3 is the XF 23mm f/2 R WR lens; a general wide-angle prime offering a 35mm equivalent focal length. This compact lens features two aspherical elements to realize high sharpness with Minimal distortion, and its f/2 maximum aperture benefits working in low-light conditions. Additionally, an internal focusing design and a stepping AF motor both help to deliver quick, near silent autofocus performance to suit both photo and video applications. Aside from benefitting the low-light performance with an expandable sensitivity range to ISO 51200, the X-Processor Pro also contributes to fast performance throughout the camera system, including a start-up time of 0.4 seconds, shutter lag time of 0.05 seconds, shooting interval time of 0.25 seconds, and a continuous shoot rate of 14 fps when working with an electronic shutter, or 8 fps with a mechanical shutter. The X-E3 supports both recording in both UHD 4K/30p and Full HD 1080/60p video resolutions. Film Simulation modes can be used during recording to give a distinct look to footage, and video can also be output via HDMI to an external recorder or monitor, and a mic jack is featured for working with an external microphone. The rear 3.0" 1.04m-dot LCD touchscreen allows for familiar operation, focus point selection, and menu navigation. High-resolution 2.36m-dot electronic viewfinder allows for bright, clear eye-level monitoring with a frame rate of 54.54 fps for smooth monitoring in a range of lighting conditions. Dedicated shutter speed and exposure compensation dials for direct, intuitive control over exposure settings. The physical exposure compensation dial now features a C position to permit an expanded compensation range when working with the control dials. An EF-X8 external shoe-mount flash is included to provide additional illumination when working in low-light conditions. The flash has a guide number of 26.2' at ISO 100. Built-in Wi-Fi and Bluetooth allow for direct wireless sharing of files as well as remote camera control from a linked mobile device. Utilizing both contrast- and phase-detection methods, the hybrid autofocus system employs 91 total points, which can be divided into 325 total areas for a high degree of focusing accuracy in a variety of lighting conditions. Approximately 50% side-to-side and 75% top-to-bottom of the frame is covered by phase-detection points in order to provide fast AF performance to suit working with moving subjects. When working with autofocus, you can choose either single-shot AF-S mode or continuous AF-C mode, and each can be used in conjunction with Single Point AF, Zone AF, or Wide/Tracking AF settings. Additionally, AF-C Custom Settings let you choose from five AF-C presets depending on how your subject is moving, and the AF algorithm has been optimized for improved subject tracking and overall accuracy. Taking advantage of FUJIFILM's vast history in traditional film-based photography, the X-E3 integrates several Film Simulation modes, which can be used for photos or videos, to mimic the look and feel of some of FUJIFILM's classic film types. A refined Classic Chrome mode is designed to deliver muted tones and a deep color reproduction, similar to that of a dated slide film. Pulling from their more contemporary line of transparency films, Provia offers natural-looking tones for everyday shooting, Velvia produces a more dramatic and rich tonality with deeper color saturation, and Astia gives less contrast for a softer depiction of skin tones. Mimicking their negative films, Pro Neg. Std. gives smooth image tones that are suitable for accurate color renditions, while Pro Neg. Hi produces a more dramatic feel with the ability to draw color out of a variety of lighting conditions. In addition to the colorful benefits of these Film Simulation modes, there are also monochrome modes that simulate the look of traditional yellow, green, and red black and white contrast filters, as well as an Acros mode that can also be paired with colored filter effects. A sepia mode is also available for producing an inherently nostalgic look. The included XF 23mm f/2 R WR lens is a compact, lightweight 35mm-equivalent wide-angle prime that is well-suited to general shooting applications. Its optical design incorporates two aspherical elements, which help to reduce spherical aberrations and distortion for high sharpness and clarity. The lens also features an internal focusing design and stepping AF motor for quick, quiet autofocus performance and the lens's physical design is weather-resistant for working in harsh environmental conditions. Advanced SR Auto mode can be used for fully automatic shooting with scene recognition to permit on-the-fly shooting in a variety of settings. In-camera 180° panoramas can be shot by simply panning the camera about the scene. Advanced Filters: Toy Camera, Dynamic Tone, Miniature, High Key, Soft Focus, Pop Color, Low Key, and Partial Color (Red, Orange, Yellow, Green, Blue, and Purple). Box Dimensions (LxWxH) 9.5 x 8.1 x 5.7"
X-E3 Mirrorless Digital Camera with 23mm f/2 Lens (Black) is rated 4.3 out of 5 by 9. Rated 5 out of 5 by Rennis from Amazing camera - portable and perfect for travel I have the X-E2S and love the feel of it as well as the images it provides. I also have gotten used to the X-T2 improvements and upgraded to the X-E3 primarily for the improved sensor and film simulations. Given the great price, I got the bundle with the 23mm f/2 as the bundle is the equivalent to the X-100F but with the flexibility of Interchangeable lenses. So far, I love it! But the touch screen takes some getting used to. I actually turned off some of the features and only use the touch screen to perform similar functions as the control wheel on the X-T2. If you're looking for a great portable camera, I highly recommend it! Rated 5 out of 5 by Chris from This camera surprised me I bought this set-up impulsively.? I already own the XPro1 and XT1 but wanted to get a prime and the form factor of this camera intrigued me.? I love the rangefinder style of camera and while the XE3 is not a rangefinder, it looks like one.? Very compact body and the 23mm is fabulous.? I shoot manual almost always and turned off the touch screen features which I found annoying.? I love the joy stick and two command dials.? And the image quality is excellent. This body with something like the 18-55 would be a terrific travel/everyday camera. Rated 5 out of 5 by Malai from Little Xpro2 I had the opportunity to try out my xe3 on a recent trip to NYC. Having experienced an aching back carrying my xpro2 on previous trips, I was eager to see how portable and comparable this new camera would be. I have nothing but good to say about this little guy. It is easy to use and program for my liking although I have to say that I didn’t use the touch screen and preferred the dials and menu items I with which was already familiar on my Xpro2. The kit 23mm f/2 lens is a gem! It’s compact size does not give up quality. I’m so pleased to add this camera to my Fujifilm family. Rated 5 out of 5 by Albert from Great compact addition to XT2 This camera is a baby brother to Xpro2 meaning range finder style with viewfinder to the left upper corner so the left eye can make contact with the subject and your nose doesn't hit the screen. As such, it's a great camera for street photography, especially combined with?23f2 lens. It has the same IQ as XT2 and fast AF tracking. I love the joystick as in my XT2 and have no issues as the other reviewers. You can set the joystick to press first to activate if you don't want to accidentally move it. If you tend to activate the touch screen by mistake, you can turn its touch AF mode off and assign the 4 swipe functions to None. But in that case, you may as well get the XT20 instead. Many switch to Fuji for the great JPEG straight out of the camera, great Fuji color film simulations. But for RAW processing, Adobe Lightroom is fine for Bayer sensor but horrible with Fuji X trans RAW files especially sharpening. Capture One and Irridient Developer are better raw converters for Fuji RAW files. even though Irridient Developer is only for Mac, they just came out with X transformer pluggin for Lightroom available for both Mac and Windows. It converts Fuji RAF files to DNG format (sharpening can be applied at this stage), which can then be processed further in Lightroom. I could see the difference in the quality and it's only $30. Rated 2 out of 5 by Antonio from Kind of dissapointing Using it for about a month. I'm new to Fujifilm cameras. Quality images seem to be pretty good. Yet usability not much. LCD touchscreen activates (with the touch of my face) when I m shooting and it can changes configurations. I didn't find the way to disable it. Bluetooth transfer apparently doesn't work when shooting with RAW format, as I always shot in RAW I don't find the transferring useful at all. The cap of the lens seems like a kids toy, it just doesn't fit tight and drops easily. It may be issues more related to get to know the camera, but after a month using it daily and missing pictures because the camera behaves in a strange way, I don't find it very friendly. Rated 5 out of 5 by Matthew from In love. Recently sold all of my Nikon DSLR gear and purchased the X-E3. This is my first digital Fuji camera, and I couldn't be more pleased. It hits every thing I wanted except a tilting screen, which I have been very comfortable living without so far. I understand that people already invested in the Fuji ecosystem were a bit dissatisfied with some of the aspects of this camera, but coming into it fresh I could not ask for more. Ease of use is incredible. Everything I want is a swipe or single button press away. Fully customizable, extremely convenient with the Bluetooth connection to the Fuji app, I can control the camera from my phone, and transfer photos super fast. The images so far have blown me away in quality, and the 23mm f2 lens is really great. I love the film simulations as I regularly shoot film too. Over all I can't find a fault in this camera for my needs. Rated 5 out of 5 by Ali E from Absolutely in love with this cam It's everything I wanted in a camera: light, slick, fast AF, and my god the images are perfect straight out of camera. The 23mm f2 is a perfect fit for street-photography. Rated 2 out of 5 by benjamin from Very Dissapointed Just finishing up a two week trip in Asia and I am immensely disappointed with this camera (owned X-T1 previously). This camera is slow, slow to acquire focus (23mm 2.0, 50mm 2.0) and slow to turn on. I have not found the focus speed an improvement over previous models and it's painful to wait for the camera turn back on. Probably the biggest flaw is the rear joystick. It is constantly getting bumped against the body causing the focusing point to move (I use a blackrapid strap- don't think it matters what type of strap used). You want to take a pic, expecting the focus point to be where it was previously, you peer into the viewfinder and it is gone, probably shifted somewhere all the way to the left or right corners. So many missed opportunities.. Overall picture quality is excellent as is dynamic range however, I really cannot recommend this camera for street photography. What is the weight of the camera plus the 23mm kit lens? I can find no mention of Vibration reduction. In this day &amp; age, did Fuji decide to omit this extremely, and sometimes critically useful feature? The X-E3 does not have in-body stabilization; With the exception of the X-H1, all Fuji systems rely on the lens for any stabilization. If in-body stabilization is important to you, the Fuji X-H1 is currently your only option. Is the Fuji 23F2 that comes with camera the same as the Fuji XF WR 23F2 lens? if I am using a manual focus lens (not a Fuji lens). Does the focus peaking still work? Yes, just choose which kind of peaking you prefer, color depends usually on what scene type you're doing, but I find red to be most effective for most scenes. However I also advise you to only go with the Low setting, because the high puts the peaking outline on too many areas for it to be useful. Does the x-e3 have focus peaking? Yes it does, though not in Std . Split Image needs to be selected. Then there are multiple colors for the highlight that can be selected. So is the body also WR ? Sorry, but no it isn't. Will all fuji lenses be compatible with X-E3? How does this camera compare with the 100 F? Top line differences. Primary thing is view finder. X-100F has a unique rangefinder like VF that can be switched from optical view to electronic view. Next the shutter on 100F is a leaf (or iris) type which is exceedingly quiet and allows high speed flash sync with any flash by any maker. Third is new touchscreen on E3.